GoldieBlox is a game designed by a female engineer who created the game out of a desire to make a STEM (Science, Technology, Engineering, and Mathematics) impact on what she views as a lame set of choices for toys and games for young girls today. I was so inspired by her video that I decided to pre-order three of the games. The boxes arrived and I was instantly impressed that the packaging wasn’t all pink and purple, as I assumed it might be. As I have argued here before, there is nothing genetically programmed into girls’ DNA to make them like pink or purple, and it’s a completely arbitrary and commercially-driven obsession that our young girls are told to have. Anyway, it’s fine; pink and purple are nice colors, whatever. The game wasn’t all pink and purple and that made me excited. OK? OK. I didn’t open the boxes for a long time. In fact, I just recently gave them as gifts to two of my closest friends’ daughters for their 8-year-old birthdays last month. My older son, ever astute to me giving other children things (since he leads a very deprived life; he’ll be the first to tell you I don’t buy him everything he wants and that’s just not fair), asked why he can’t have the third game. I had no good answer; I wasn’t going to say it’s for girls only, right? I told him it’s designed with young girls in mind but he said it looked fun so why can’t he play with it? (Note to the creator of GoldieBlox: well done, sister!) We opened it and had the best time following the little game book that walks you through the set-ups and meeting the characters in the game, each of whom hails from a different country. One is a dolphin (Russia), one is a dog (Mexico), one is a cat (from New England), one is a bear (Brazil), and one is a sloth named Phil (my personal favorite because I love sloths, but he’s the only one I can’t figure out where he’s from). The book instructs you how to set up gears, shifts, cranks, and ribbon to make the animals spin on the spools they sit on. 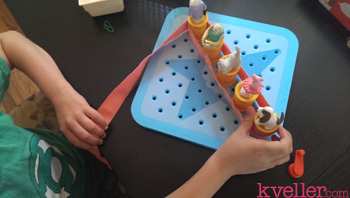 It allows for creative exploration and problem-solving in a fun way, with more challenging tasks as an option. We played together and then my son ended up playing ON HIS OWN for almost an hour! He loved making new shapes and making the suggested ones and also creating his own. I kept wondering if girls would do the same, and I kept thinking over and over: YES! My son went back to the game two more times that day, on his own, and played for upwards of 30 minutes each time. He loves GoldieBlox. Great! He’s almost 8 and he seems the perfect age for this game. My almost 5-year-old doesn’t have the dexterity or problem-solving skills yet but loves the look of the game and how cute the animals are. He also liked watching the end result of all of the animals spinning about. Hooray for GoldieBlox, hooray for my kid actually playing on his own for more than two minutes, and hooray for a truly creative and entertaining toy for boys and girls! Thank you, GoldieBlox! Get GoldieBlox on Amazon, and a portion of the proceeds will go to support Mayim’s writing on Kveller.